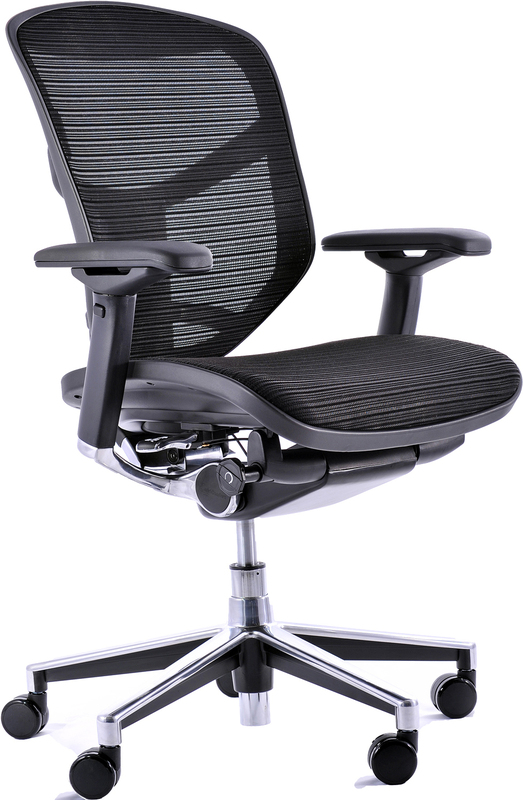 A good quality ergonomic chair will go a long way in improving productivity, comfort and long-term health. With many office workers spending eight to twelve hours or more seated at their desks each day, a task chair that provides proper support is crucial. To get the true benefits of your task chair, ensure the other work tools you are using keep your body in a neutral posture. The best chairs are intuitive, easy to use, and don’t need a lot of adjustments to fit you perfectly. To adjust your chair to the correct height, make sure your feet can sit flat on the floor or on a footrest with your thighs parallel to the ground. The seat pan should be adjusted so it is not touching the back of your calves. You should avoid chairs with backrests that can be locked into one position as this restricts movement. Look for a chair with dynamic weight-sensitive self recline that automatically adjusts to the tension in your body. The natural curve of the lower back should be supported when seated. Task chairs should automatically be comfortable without the need for any external lumbar devices. Armrests are not necessary for everyone, but if you are looking for this feature make sure they are height-adjustable and not fixed. They should be soft and padded and be able to adjust down as low as the height of your elbow when your hands are in your lap. OSHER WORLDWIDE GROUP is the most diversified health care company in the India and a leader worldwide in helping people live healthier lives and helping to make the health system work better for everyone. We are committed to introducing innovative approaches, products and services that can improve personal health and promote healthier populations in local communities. Our core capabilities in clinical care resources, information and technology uniquely enable us to meet the evolving needs of a changing health care environment as millions more Indians enter a structured system of health benefits and we help build a stronger, higher quality health system that is sustainable for the long term. OSHER WORLDWIDE GROUP is the most diversified health care company in the India and a leader worldwide in helping people live healthier lives and helping to make the health system work better for everyone. We serve our clients and consumers through distinct platforms like Occupational health services, Sports Rehabilitation, Heath and wellness, Ergonomics services, Rehabilitation services, Home care services, Medical tourism, Hospital marketing & planning, Elderly care, vaccination services.